Protection of transmission system is crucial for the secured and stable operation of power system. Under stress conditions, the operating parameters of power system violate their limits. From the past anatomy reports of several blackouts, it is clear that equipment, control, and protective relay failures are the major causes behind large power system failure. From study, it is also revealed that failure of back-up protection is more prone during system stressed conditions. In transmission system, third-zone of distance relay is highly affected by system stressed events such as voltage instability and load encroachment. As third-zone protection is a delayed protection scheme, with the help of wide area measurement system better protection function can be provided to reduce future percentage of blackout. In this chapter, a detailed discussion about the existing solutions is provided to mitigate the issue of system stressed conditions and a synchrophasor technology-based approach is provided. Results for different cases are provided to show the efficacy of the proposed method. Generally, the electric power system comprises electrical components that are equipped to supply, transmit and distribute the electric power for the utilization. Generators supply the power by the utilization of natural resources. The transmission system transmits power from generating stations to distribution sub-stations, there the electric power is distributed among the connected utilities. Hence, the power flow is unidirectional. As compared with the last two decades the demand for the utilization of electricity increased due to rapid growth in population. Even though the expansion of the existing interconnected power system network is restricted due to economic constraint. Adoption of distributed generating units such as solar power (Zamani,2018; Makdisie, 2018) and wind power makes the direction of power flow become bidirectional that requires advanced power flow controlling devices. 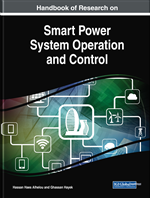 Implementation of smart grid concepts in the electric power network provides secure operation with the combination of electric vehicles and high penetration level of renewable energy resources (Alhelou, 2015; Alhelou, 2016; Alhelou, 2018; Alhelou, 2018; Alshahrestani,2018). However, it increases the use of effective communication system for the system visualization. Interconnections between the areas provide reliable operations of the system during emerging conditions but the number of parallel lines is increased which cause congestion as shown in Figure 1. Planned or forced outage of generating units causes unbalancing between generation and load demand. This leads to a significant change in system frequency which is tuned by load frequency controllers (Fini, 2016; Alhelou, 2018; Nadweh,2018; Njenda 2018). As the consequences of all these makes the operation of power system very closer to its security limits. Whenever a fault or abnormal conditions occur and that persists for a long time on such system, then it will damage certain portion of the system. Thus, causes an imbalance between the electric power supply and load demand. Consequently, it may lead to initiation of cascaded events which make failure or collapse of the power system i.e. blackout. As per the North American Electric Reliability Corporation (NERC) reports, the possible failures that are continually supporting the occurrence of blackouts in the real time power system listed in a flow chart as shown in Figure 2. Suppose if anyone among these failures present in the modern power system, then the system gets stressed and gives rise to cascading events. Thus, the propagation of cascaded events may lead to blackout scenario. To prevent future blackout, a detailed steady state and transient study of power system is essential. Therefore, it is required to study and extract the valuable information to understand the initializing events, causes and other aspects of blackout. Zone of Protection: It is the segment of a power system in which the occurrence of assigned abnormal conditions should cause the protective relay system to operate. Reliability: A measure of the degree of certainty that the relay, or relay system, will perform correctly. Protective Relay: It is an intelligent electronic devices (IEDs) which receive measured signals from the secondary side of CTs and VTs and detect whether the protected unit is in a stressed condition (based on their type and configuration) or not. A trip signal is sent by protective relays to the circuit breakers to disconnect the faulty components from power system if necessary. Dependability: Dependability is the degree of certainty that the relay will operate correctly. Selectivity: The property by which only the faulty element of the system is isolated, and the remaining healthy sections are left intact. R-X Plot: A graphical method of showing the characteristics of a relay element in terms of the ratio of voltage to current and the angle between them. Distance Protection: A fault in a transmission line will result in the decrease of line impedance which is compared with a pre-defined threshold value. The trip signal will be sent to the breaker if the measured impedance is smaller than the threshold. Reach: The maximum distance from the relay location to a fault for which a particular relay will operate. The reach may be stated in terms of miles, primary.